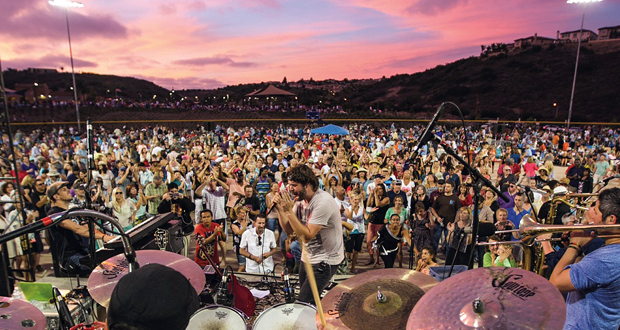 Free Friday Summer concerts in Carlsbad start this week – a tradition that has truly become an integral part of the community’s life. Presented by the City of Carlsbad’s Cultural Arts Office, the concert series began in 1986 and has grown to nine weeks of great music, dancing and picnicking with family and friends! Schedule and info below. In 2015, TGIF Concerts in the Parks will celebrate its 30th summer season! The annual concert season begins in late June and continues every Friday evening through mid-August. Concerts begin at 6PM and end at 8PM and are FREE. TGIF has beautiful park settings on Carlsbad’s largest baseball fields, free offsite parking and shuttle bus service, a variety of food vendors, and hands-on art activities for children at each location’s first concert. Newsletter: Subscribe to our email newsletter of San Diego events, festivals, specials, & GIVEAWAYS! This entry was posted in All Ages, Art, Carlsbad, Events, Family Friendly, Festivals, Food & Drink, Free, Music and tagged 2015 carlsbad august events, 2015 carlsbad california events, 2015 carlsbad july events, 2015 carlsbad june events, 2015 san diego august events, 2015 san diego festivals, 2015 san diego july events, 2015 san diego june events, 2015 san diego may events, 2015 san diego september events, 2015 san diego summer events, carlsbad california events, carlsbad june events, Carlsbad TGIF Concerts, carlsbad tgif concerts in the park schedule, carlsbad tgif concerts in the parks, free carlsbad events, free carlsbad music events, free carlsbad summer concerts, free carlsbad summer events, san diego august events, san diego concert events, san diego events, san diego fourth of july events, san diego free summer events, san diego july events, san diego june events, san diego music events.